Swing open the massive wooden front doors, inlaid with intricate stained glass, step past the threshold from the tiled floor of the foyer, and enter a space of breathtaking old world beauty. 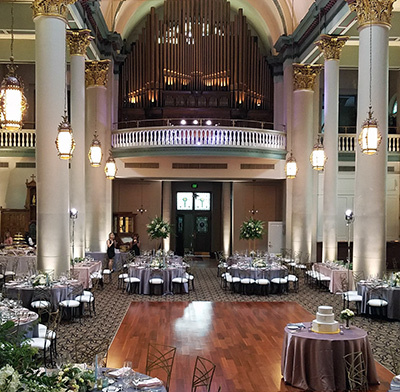 Family owned and operated by Ed, Mary Ann, John and Suzanne Graf since 1995, this is Pittsburgh’s Grand Hall at The Priory. Whether it’s the Grand Hall’s rolling barrel vaults and arches, soaring 80 feet into the air, its massive supporting columns, topped with gold-leafed Corinthian capitals, or the intricate, gold-plated stencil-work gracing the ceiling, the Grand Hall’s physical space inspires a sense of wonder. Yet it is not just the grandeur of the physical space that sets the Grand Hall apart: it is also its sense of place and time. Built as St. Mary’s Church in 1854 by German immigrants, the Grand Hall was for years a hub of the German, Swiss and Austrian community in the “Deutschtown” section of Pittsburgh. Restored in 1995 and re-opened as a banquet facility, the Grand Hall and the adjacent Priory Hotel (the former St. Mary’s Priory [or Monastery) is now a keystone of the redevelopment of Deutschtown and of Pittsburgh’s North Side. The value of a beautiful space is diminished if the quality of the food and service do not match the quality of the room. The Grand Hall’s food and service are unrivaled in the Pittsburgh region. Chefs Michael Henny and Pete Phillipy have more than 40 years of combined service in kitchens ranging from the Hyehold Restaurant to Nemacolin Woodlands resort, and consistently serve world class food. General Manager Rebecca Lazeration, with years devoted to banquet and event management, ensures that linens are crisp, silverware is polished, and that the staff is well-trained to accommodate any guest need. Centrally located across the Allegheny River from downtown Pittsburgh, with Interstate 279 and State Route 28 just blocks away, the Grand Hall is easily accessible from all points of the compass. Pittsburgh’s suburbs are just minutes away, and even drives from other counties are short and easy.